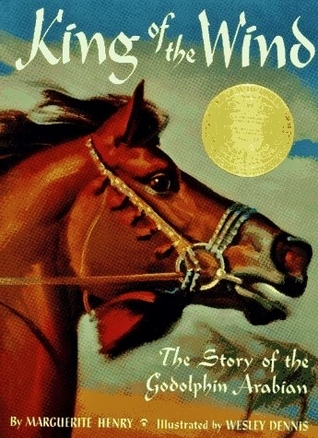 King of the Wind, is the fictional biography of Sham, the horse which will come to be known as the Godolphin Arabian, and his master, Agba, a mute orphan, whose loyalty to his horse never wavers despite serious hardships. I had a really hard time getting into this book on my own, and I wound up relying heavily on the audiobook, read by David McCallum, to get me through most of the story. I am not interested in horses - or animals, really - so reading a book about a horse where the human main character doesn't even speak felt somewhat tedious to me. Hearing the language in the voice of an actor really helped me appreciate the value in the book, despite my own lack of interest in the subject matter. Marguerite Henry truly has a gift for writing detailed descriptions that convey strong emotions. She is also a very economical writer, giving the reader only those scenes which truly add something to the plot. She handles time well, jumping forward in large chunks as needed to keep the story flowing, and her characters, even those who appear only briefly, have memorable traits that make them easy to get to know. This is especially true of Agba, whose "voice" is very strong despite his physical inability to speak. There is some general historical value in this book. The reader is able to see what life was like in 1724 Morocco, as well as France during the reign of Louis XV. Like Adam of the Road, it focuses on a journey, so readers are able to meet people from many different walks of life and get a taste for how they lived. First and foremost, though, this is a story about a boy and a horse, and its primary audience is always going to be kids who love horses. I would certainly not disapprove if my kids want to enjoy it for pleasure reading - it is a Newbery winner, after all - but it doesn't seem like it will be a strong part of my homeschooling curriculum beyond that.